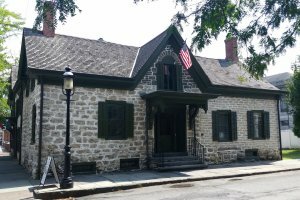 The Matthewis Persen House is one of Ulster County’s oldest, most significant buildings. Named after its longest residing owner, Matthewis Persen (1739-1819), the House is located within Kingston’s Stockade National Historic District. Its earliest portions date from c.1661 and it is one of four landmark buildings on each corner of John and Crown Streets. Each house pre-dates the Revolutionary War.